Pure almond oil, in other words, sweet almond oil, is considered to be one of the best products of this type. The decisive factor is that it is natural, safe and effective. Almonds and almond oil are especially popular among Italian women. What properties and composition does almond oil have? How does it work and what is its cosmetic use? Cold-pressed almond oil is rich in protein substances, unsaturated fatty acids, vitamins A, B2, D, and E, as well as minerals, such as: iron, magnesium, manganese, phosphorus, potassium, sodium and zinc. Almond oil is a 100% natural cosmetic remedy that will not harm newborns, pregnant women and people with problematic skin. This wonderful substance supports the treatment of acne, irritation, and redness. Almond oil does not irritate or sensitize and provides a healthy and beautiful appearance of both skin and hair. Furthermore, almond oil is a great base for perfumes, soaps, creams, balms and massage oils. It has an amber color and a light, characteristic smell. Almond oil is suitable for use for a maximum of 6 months after opening the package. It is best to store it in a shaded place, because it is sensitive to external factors. For this reason, it can oxidize and consequently lose its properties. How does almond oil work? Almond oil is considered an effective emollient, because it prevents skin cells from dehydration and moisturizes well. In addition, it nourishes, softens and regenerates the skin and makes the latter regains its glow, freshness and healthy look. Almond oil protects against harmful weather conditions, especially the sun, wind, and cold. It strengthens the hydro-lipid coat of the skin, prevents the capillaries from dilating and, as a result, improves the appearance of the skin. Almond oil used on regular basis prevents the formation of stretch marks and reduces scars and cellulite. For this reason, it is worth moisturizing the whole body during pregnancy and weight loss. In addition, almond oil has a strong anti-aging and anti-wrinkle effect. The product has a small molecular weight, so it penetrates the skin deeply and very easily fills in wrinkles, which become shallower. 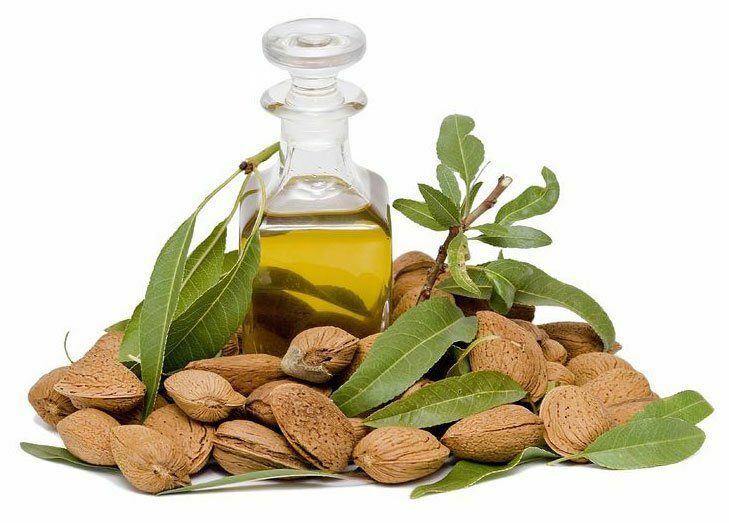 In addition, almond oil inhibits the appearance of new wrinkles and firms the skin. Almond oil regenerates brittle, dry and damaged hair, which is why it has been widely used in the production of hair conditioners. It works just like argan oil, but it is a much cheaper solution. To make the best of it, it should be rubbed into the ends of the hair. For even better results, wait a few minutes and thoroughly rinse the hair under running water. In addition, almond oil eliminates dark under-eye circles. Just combine 2 teaspoons of honey, 2 teaspoons of almond oil and a teaspoon of oily milk. The resulting paste should be applied to the skin under the eyes for about 10-15 minutes. Then, remover the mask with a cotton pad or a gentle stream of warm water. What’s more, almond oil effectively removes makeup, even waterproof cosmetics. For this purpose, it is sufficient to soak a cotton swab with almond oil, apply it to the part of the face which you want to remove the makeup from, and after 2-3 minutes, gently press it down. As a result, the face is clean and moisturized. OCM – oil cleansing methods is a good idea not only for makeup removal but also for comprehensive moisturizing and nourishing the skin. In addition, almond oil exfoliates dead skin cells, which is why it will work perfectly as a face scrub. To prepare it, just mix a teaspoon of sugar or coffee (any granulated one) with a few drops of almond oil. As a result, your face will be smooth and full of radiance. Almond oil moisturizes the hands and feet, so if you do not have your favorite hand cream, try out almond oil. Due to the efficiency of the latter, just a few drops are enough to cover the skin of your hands and feet. Almond oil will just as well replace the lip balm and cosmetic designed to soften nail cuticles. In addition, you can add it to your favorite cream and balm. Do not overdo it with the quantity; otherwise, the cosmetic will become too greasy. To sum up, almond oil effectively moisturizes, nourishes and is well absorbed, and at the same time, it does not leave an oily layer, which is why it can be used for body massage. Moreover, it is used both in professional beauty salons and for at-home beauty treatments. Almond oil is the so-called dry oil; because the structure resembles human skin, it works well with it. The many uses of almond oil are impressive, but these are not its only advantages. Almond oil is completely safe, gentle on the skin, easy to apply, and quickly absorbed without leaving an oily layer on the skin surface. You can buy it in healthy food stores, drugstores, pharmacies and online stores at an affordable price. It is worth using it because it provides a healthy and beautiful appearance of both the skin and the hair.